Synopsis: A young man finds romance with a princess who has fallen on hard times when he works as a singer in a hotel in Acapulco. It’s 1963 and the hip-swinging, floppy-haired Elvis (G.I. Blues, Easy Come, Easy Go) from seven years earlier has been replaced by a sleeker, clean-cut version with meticulously styled hair and a taste for fitted shirts and slacks. It’s as if he’s been badly cloned and the product subsequently dipped in Formica, which is quite ironic in a way because for much of this film we’re not watching the real Elvis but a slightly taller and lankier double. 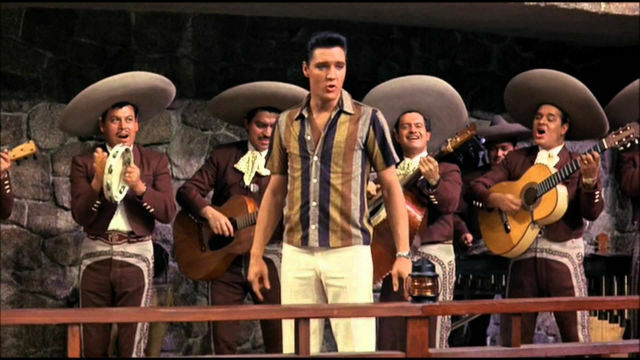 The real Elvis got no nearer to Acapulco during the making of this flick than I did during the watching of it, and it’s quite jarring the way the film keeps flipping back and forth between location shots and studio sets in the course of a scene. Elvis had evidently given up all aspirations of being a serious actor by the time this folly was produced. He was in some decent pictures in the late fifties and early sixties, but was too lightweight an actor to live up to them. It seems he had found his level, and could hardly complain. Fun in Acapulco is filled with catchy tunes that are instantly forgettable – until the last twenty minutes or so, when director Richard Thorpe starts piling on the psychological angst with a teaspoon. Although the film itself is as forgettable as its songs, it’s pleasant enough if you’re in an undemanding frame of mind and looking for an escape from the realities of your life.